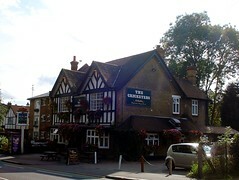 McMullen pub in South Woodford. It has two separate bars, a public bar and a lounge bar. The public bar is nice enough, with dark wood decor, matched wooden tables and chairs, and a burgundy banquette underneath the bay window. There are montages of photos of the regulars on the wall, and a dart board. Kake visited on a Thursday afternoon in September 2008, and sat in the public bar. There were half a dozen regulars already in when I got there, and the radio was playing, though not too loudly. Three McMullens beers were available on handpump; I had AK at £1.19/half. Service was friendly and the regulars weren't unwelcoming. No food on Sundays, according to the 2007 Good Beer Guide. Last visited by Kake, 4 September 2008. Opening hours taken from the 2007 Good Beer Guide. Last edited 2016-09-18 15:31:49 (version 17; diff). List all versions. Page last edited 2016-09-18 15:31:49 (version 17).